1. To Enter. Enter at www.Keds.com/CA, selected Sponsor events, or retail stores owned and operated by Wolverine World Wide, Inc., between the Promotion Period by completing an Entry Form in its entirety. LIMIT ONE (1) ENTRY PER PERSON. Odds of winning depend on the number of eligible entries received. All entries become Sponsor’s property and will not be returned. By participating in this Sweepstakes, you accept and agree to these Official Rules and the decisions of the Sponsor, which are final and binding in all matters related to this Contest. 2. Prize Drawings. One (1) prize will be awarded for each month during the Promotion Period (“Monthly Period”). To be eligible for a prize, entries must be received between 12:00 a.m. ET on the first day of the Monthly Period and 11:59 p.m. ET on the last day of the Monthly Period. Winners will be determined within three (3) weeks after each Monthly Period, in a random drawing from eligible entries received during that Monthly Period. Potential winners will be notified within three (3) days of the drawing by e-mail, and may be required to sign and return an affidavit of eligibility/liability release. A prize will be forfeited and an alternate winner selected if the prize notification is returned to Sponsor as undeliverable, or if the selected entrant: (a) does not respond to the prize notification within three (3) business days, (b) does not meet eligibility criteria, or (c) does not fully comply with these rules. 3. Prizes. 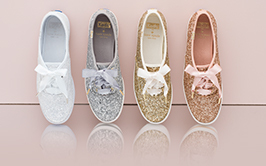 Twelve (12) Monthly Prizes: each consisting of a $100 credit valid towards the purchase of any merchandise at www.Keds.com/CA. Prizes are non-transferable and cannot be substituted or redeemed for cash except in the sole discretion of Sponsor, which reserves the right to substitute a prize or equal or greater value. The credit expires 90 days after issuance. 4. Eligibility. No Purchase Necessary to Enter or Win. Must be 18 years or older at the time of entry and a legal resident of Canada. Void where prohibited by law. Employees of Sponsor and its licensed dealers, agents and affiliates, and such employees’ immediate families are ineligible. Immediate family members include relatives living at the same address as an employee. All national, federal, provincial and local laws, rules and regulations apply. Void where prohibited. 5. General. Acceptance of a prize constitutes the winner’s consent to the use of their name and/or likeness for advertising without additional compensation, where not prohibited by law. All taxes and other expenses are the sole responsibility of the winners. Sponsor is not responsible for and shall not be liable for: (a) illegible, incomplete, damaged, misdirected, stolen, late, or lost entries; (b) errors or delays in entering; (c) any condition caused by events beyond the control of the Sponsor which may cause the Sweepstakes to be disrupted or corrupted; and (d) any injuries, losses or damages of any kind caused by the prize or resulting from acceptance or use of the prize, or from participation in the Sweepstakes. Any entrant attempting to defraud or in any way tamper with this Contest, including but not limited to using automated processes for entry, will be ineligible. If for any reason the Contest is not capable of running as originally planned, Sponsor at its sole discretion reserves the right to modify or cancel the Contest. 6. Sponsor/Administrator. The Sponsor/Administrator of the Promotion is Keds, a part of Wolverine World Wide, Inc., 6225 Millcreek Dr, Mississauga, ON L5N 1L8 (“Sponsor”). 7. Winner. The names of Prize winners may be requested by sending Sponsor a self-addressed, stamped envelope, attn: Keds Monthly Enter to Win Contest, by January 31, 2020. 9. Quebec Participants. Any litigation involving an entrant residing in Quebec relating to the conduct or organization of the Contest may be submitted to the Régie des alcools, des courses et des jeux for a ruling. Any litigation relating to the awarding of a prize may be submitted to the Régie only for the purpose of helping the parties reach a settlement.